Escape the big city on this scenic day-trip to Monterey and Carmel. Drive along the Highway 1 with breathtaking views of the Pacific Coast seascapes and narration as you may your way down to the Bay. You'll have time to shop and have lunch in Monterey, with the option of visiting the famous Monterey Bay Aquarium, and enjoy plenty of photo stops on this scenic day trip from San Francisco. 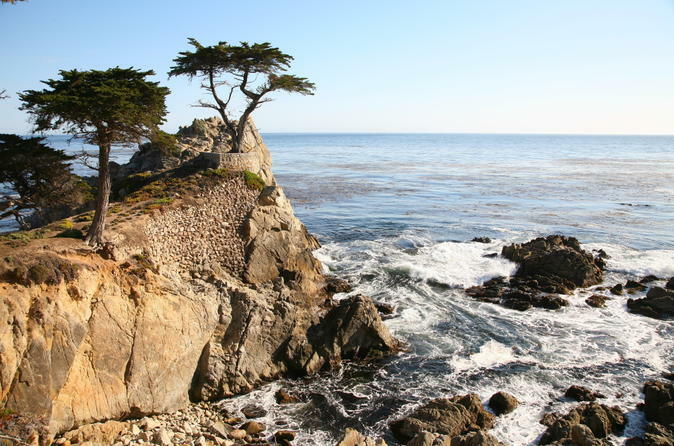 No trip to California is complete with a drive along the famous 17-Mile Drive, home to the world-renowned Pebble Beach Golf Course, the Lone Cypress, magnificent mansions, playful wildlife along the coastline and breathtaking natural beauty. Then, you'll head to the enchanting Carmel-by-the-Sea, with a charming downtown shopping district, beautiful beaches and historic mission. On this last stop of the tour, you will have time to visit the many boutiques and art galleries. Monterey Bay Aquarium option (select tour option at time of booking): Use your time in Monterey to visit the acclaimed Monterey Bay Aquarium. Spend your two hours in town to explore its fascinating exhibits with jellyfish, otters, a kelp forest and even a sunfish.This iconic attraction is a must-see! Special Offer - Book by May 25, 2018 to save 11% off our previously offered price! - Book Now!